What is good? Fruit salad. What is awesome? 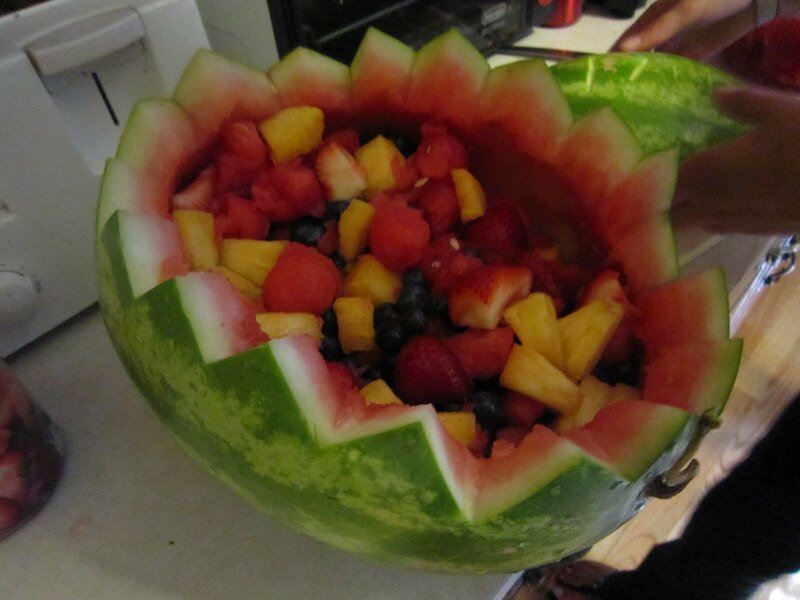 Rockin Fruit Salad inside a Watermelon. This is a simple trick that my friend showed me (and, I have on good authority, most of the world already knows) to make fruit salad much more awesome. Step 1) Buy a watermelon and other fruit. 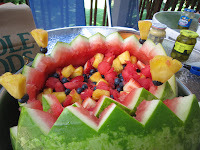 Aesthetically, the watermelon will give you green and red color, so if you buy blue and yellow fruit you will be covering quite a range of colors with fairly little effort. 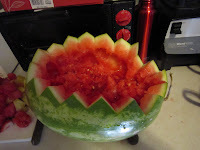 Step 2) Chop off top third of watermelon with a big ol' knife. Do this in a serrated pattern (just stab it and alternate the angle of the blade), and be sure to keep the top. Step 3) Hollow out watermelon and replace insides with other fruit (and put some of the watermelon back in). You will also need to scrape the watermelon off the lid piece. 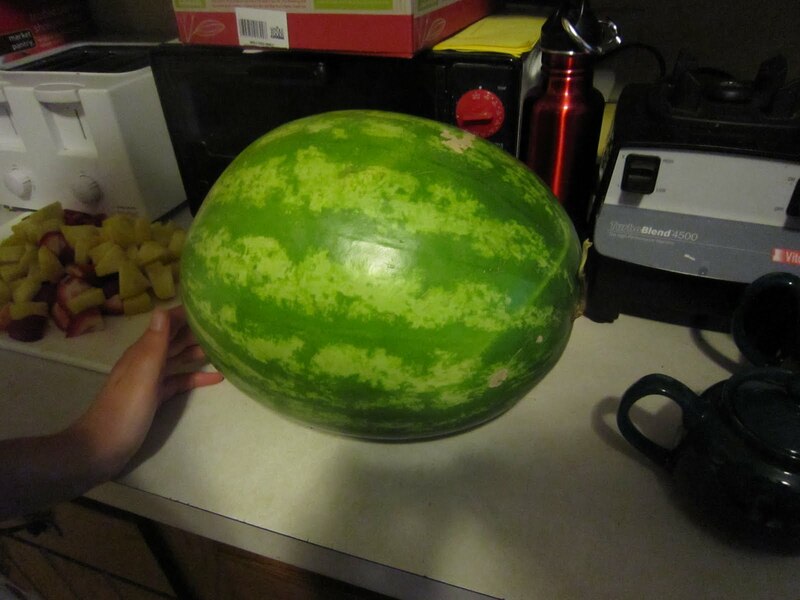 One watermelon holds exactly one watermelon worth of fruit inside, so you will end up with as much leftover watermelon as you put in non-watermelon fruit. Step 4) Label appropriately. It is very embarrassing to bring the wrong rockin' watermelon to a gathering. 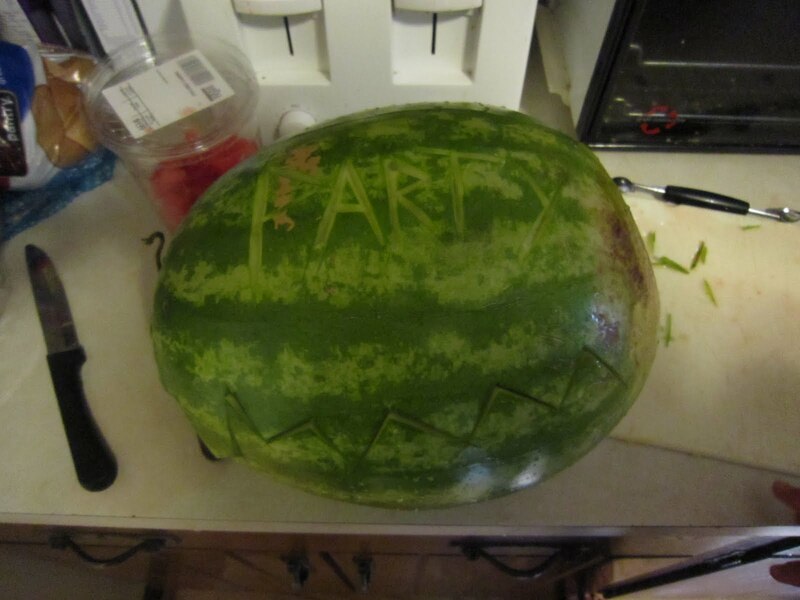 I used a small knife and made very shallow 'v' shaped cuts into the melon to make the letters. Step 5) When arrived at your event, you may further decorate your rockin' watermelon with toothpicks and whatever pattern of fruit you fancy, such as these pineapple tiki torches.